In the past, relatively unqualified people could set themselves up as financial advisers – and live off the high commissions many of their products delivered. But regulations have been tightened, and the industry now boasts a growing body of well-regulated professionals. Just as you would use a map for directions on how to get somewhere, you should have a financial plan to make sure that your financial affairs are in order and your financial needs can be met. However, a plan or map by itself is not nearly as handy as one that is implemented on an ongoing basis with the assistance of a guide, and your financial planner can be your guide. Financial planners come from varying backgrounds and operate in many different ways. It is critical, when choosing the right planner for your circumstances, to find out exactly who you are dealing with, whether they are licensed or qualified, where their field of expertise lies, and which institutions they are authorised to represent. You can use either an independent financial planner or a planner who is affiliated to a financial services company. A planner affiliated to a financial services company will be able to advise you only about products from that company whereas someone who operates independently is in a position to give you objective advice and can draw on investment and risk cover solutions from a range of financial institutions. 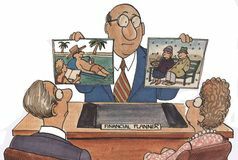 Until some years ago there were no legislative requirements for financial planners, and many broker or product-peddlers claimed to fulfil the services of financial planners – to the detriment of their clients. However, this scenario changed in 2002, with the implementation of the Financial Advisory and Intermediary Services (FAIS) Act, which introduced minimum qualifications and operational requirements as well as a code of conduct for financial planners. Anyone practicing in this field has to, in terms of the FAIS Act, have a licence issued by the Financial Services Board to operate as a financial services provider (FSP). Sometimes, you will find that a company holds an FSP licence. The FSP will employ both representative and “key individuals” who must ensure that all the representatives are fully aware of the requirements of the FAIS Act. Personal honesty and integrity: You cannot practise as a financial planner if, at any time in the past five years, you have been found guilty of unprofessional conduct, or fraud, theft or any other crime. Competence: Financial planners must have the relevant experience and qualifications to fulfil their responsibilities. Financial soundness: Financial planners cannot be under liquidation or provisional liquidation or have been declared insolvent. In other words, their own financial affairs must be in good order. When you choose a financial planner or adviser, he or she should be someone you feel you can trust because the information you disclose can be very personal. You need to be open about your financial affairs as well as events in your life such as a divorce or the death of a loved one. As a first step, your planner should clearly explain the services he or she provides and define both parties’ responsibilities. This is required in terms of the FAIS Act. Not all financial planners are qualified to give you advice on all aspects of your finances. You may find that your planner can advise you on estate planning but not on tax. If this is the case, he or she may outsource your tax to a qualified tax practitioner (and charge you for the service) or may simply refer you to one. It is important that you find out upfront exactly what your financial planner is qualified to advise you on. Ideally, you should have a contract setting out details such as how often you will meet, how often you will receive written updates on your investments and policies, payment of fees or commissions, and what would happen if he or she left the company. In terms of the FAIS Act, your planner should also disclose upfront how he or she will be paid and by whom. Traditionally, financial advisers worked on a commission-only basis, where commission was paid to the adviser directly by the company with which you invested. However, the industry is moving away from the commission-based model to a fee-based one. This website has a database of financial planners licensed as FSPs in terms of the FAIS Act. Launched about four years ago by certified financial planner, Chris Preen, the site lists about 500 planners. Details of the planner’s employment history. This will give you an idea of where his or her strengths lie. Details of the planner’s professional indemnity insurance and how much he or she is covered for. If you suffer a loss as a result of negligence or poor advice and make a claim for damages, this is the maximum amount the planner’s insurer will pay out. Professional indemnity insurance is especially important if you are dealing with a small business or someone who is self-employed. The FPI has a search facility for financial planners on its website. Click on the link “find a financial planner” on the bottom left of the screen. You can also enter the dialing code of the area you live in. The search will give you details of all the financial advisers in that area, with ticked boxes next to those planners who fit your search criteria. The information reflects only the planner’s name, certificate level, contact details and suburb. You should be looking for a planner with a CFP qualification. Or you can look for the details of a financial planner who has been recommended to you by typing in his or her surname. This article was first published in Personal Finance newspaper in 2009/2010.